The term Naga people (Burmese: Naka, Hindi: नागा) refers to a conglomeration of several tribes inhabiting the North Eastern part of India and north-western Burma. The tribes have similar cultures and traditions, and form the majority ethnic group in the Indian state of Nagaland. Some of the prominent Naga tribes are Angami, Ao, Chakhesang, Chang, Khiamniungan, Konyak, Liangmai, Lotha, Pochury, Phom, Poumai, Rengma, Rongmei, Sangtam, Sema (Sumi), Tangkhul, Mao (Memai), Zeme, Zeliang, Yimchunger,. The Naga tribes practised headhunting and preserved the heads of enemies as trophies before the 19th century. They have been in India for centuries but they didn't have any contact with other people until 1228. They started having frequent contacts with other people from 1828 when British took over Assam and began exploring the area. Naga believed in many gods, but after the British missionaries came in the 1870's the Naga were forced to became Christians. They face problems because they are Christians and their faces seem as if they are not Indians, but they are Tibetian. 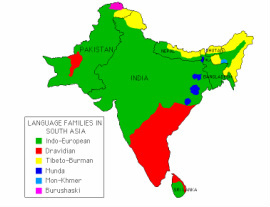 Ancient peoples of India, Bengali people, Chakma, Dravidian peoples, Ethnic groups in India by state,Exotic tribes in Hindu scripture, Gurjar, Gurkhas, Himalayan peoples, Hmar, Immigration to India, Indigenous peoples of India, Indo-Aryan peoples, Indo-Mongoloid,Irani people, Jat, Jews and Judaism in India, Kashmiri people, Kashmiri tribes, Konkani people, Kumhar, Marathi, Meitei people, Memon people, Mizo clans, Mizo people, Naga people, Parsi people, Punjabi tribes, Rajput clans, Syrian Malabar Nasrani, Tai peoples, Tamil. The process of solving the issue of dealing with such a large amount of minorities is always in the government agenda. A "GOVERNMENT OF INDIA NATIONAL COMMISSION FOR MINORITY EDUCATIONAL INSTITUTIONS" has been created to solve the problem of large number of languages and different education activities in schools. The Constitution gives freedom and rights to any minority in terms of languages and religions. 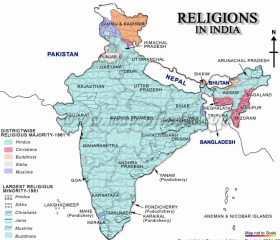 Hinduism is not a united belief, it is composed of many beliefs such as tolerance and openess. It is the world oldest religion and the most diverse. Muslim is a monotheistic religion, it is based on a Quran. The Prophete Muhammad created this religion. Christianity is a monotheistic religion, based on the life and teachings of Jesus as presented in canonical gospels and other New Testament writings. Adherents of the Christian faith are known as Cristians. Sikhism is a monoteistic religion, primary originated in the 15th century in the Punjab region. A sikh is a follower of Sikhism. Buddhism is a religion and philosophy encompassing a variety of traditions, beliefs and practice, based on teachings attributed to Buddha. Animism refers to the belief that non-human entities are spiritual beings, or at least embody some kind of life-principle. Jainism that prescribes a path of non-violence towards all living beings.